To be honest, though, I wasn't initially very excited about quinoa and potatoes, and when I say it like that it probably doesn't sound very good to you either. 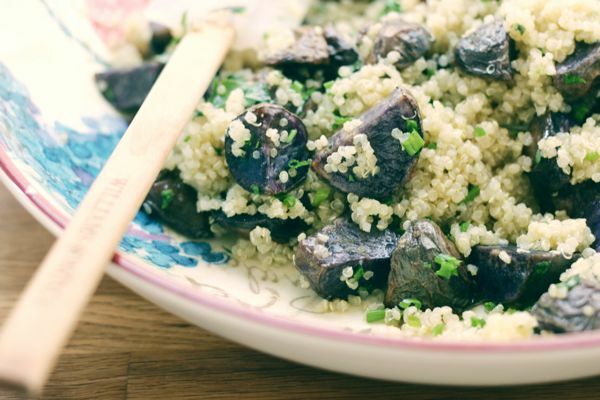 But deep, amethyst colored potatoes baked until crisp and brown and glossy from the olive oil goes incredibly well with quinoa and fresh herbs. I tend to eat quinoa salads on their own, but this would also make an excellent side dish for skirt steak or grilled chicken. I always make enough for leftovers, but if you're cooking for one as a main or as a side dish for two, try starting with 1 cup quinoa and 2 cups of stock. Adjust the vinaigrette to your own taste and if you have some left over, save it for another salad. Preheat oven to 450 degrees. Drizzle potatoes with olive oil, salt and pepper and roast for 40 to 50 minutes, until golden brown and cooked through. Make a simple dressing by slowly whisking olive oil into the lemon juice. Season with salt and pepper. Add the quinoa to a large bowl. Pour on some of the dressing, then add the potatoes and toss to combine. Add more dressing if the salad is too dry. Add the herbs and serve.